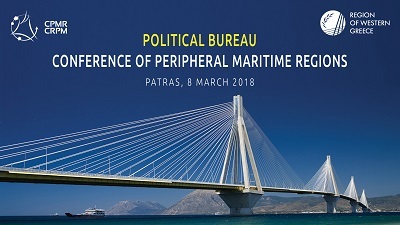 The CPMR’s Political Bureau will gather in the city of Patras, in the region of Western Greece, on 08 March to agree the policy position of member regions for the post-2020 EU budget. The meeting, organised at the invitation of Mr Apostolos Katsifaras, Regional Governor of Western Greece and President of the CPMR’s Intermediterranean Commission, takes place at a crucial time for the CPMR and its regions. The European Commission will soon make critical decisions that will change the course of the European project for good. The long-awaited adoption in May this year of its proposals on the EU budget for post-2020 will be the result of difficult budgetary choices. In fact, the Commission last week published its proposals on the future of Cohesion policy in the future EU budget, presenting potential scenarios for cuts of 15% or even 30%, which would signify an irreversible blow to the future of the policy. Added to this, the President of the European Commission, Jean-Claude Juncker, has floated plans to make the EU’s work more efficient, including the idea of the ‘lead candidate’ experiment where political parties would have to choose their candidates for the 2019 European elections at the end of 2018. It is in this landscape of political change that representatives from the CPMR’s member regions will agree the priorities that deserve stronger support from the Multi-annual Financial Framework (MFF) after 2020. Proposals for approval by member regions will include the need for an ambitious future EU budget, recognition of the added value of programmes under shared management, and the importance of sufficient leeway for regions realise the EU’s ambition on the ground. The session on the ‘Future of Cohesion policy’ will include an update on the potential scenarios for Cohesion policy post-2020 and the CPMR’s proposals for the future policy. Following this, the ‘Transport and Accessibility’ session will outline the future prospects for the EU’s transport policy, in relation to its contribution to territorial cohesion and accessibility, support for sustainable maritime transport, and the role of the regions in implementing EU instruments. As the day progresses, the session on Maritime Issues will involve the presentation of the CPMR’s draft policy position on the future of the European Maritime and Fisheries Fund (EMFF). Moving on to Migration, this session will present the results of the CPMR survey and the draft Issue Paper on ’Migration and Asylum in EU Regions: Towards a multilevel governance approach’ by Mrs Ana Terrón Cusi, President of Instrategies and Consultant to the CPMR on migration issues. The Political Bureau will be completed with discussions on the Future of Europe and Brexit, and the CPMR’s actions on the issues.